7th International Congress of Serbian Society of Mechanics will be held on 24-26 th June 2019 in Sremski Karlovci. The increasing necessity to solve complex problems in Theoretical and Applied Mechanics requires the development of new ideas and innovative methods for providing solutions. The purpose of the Congress is to bring together the scientific communities of Theoretical and Applied Mechanics in an effort to facilitate the exchange of ideas in topics of mutual interests and to serve as a platform for establishing links between research groups with complementary activities. The community of Theoretical and Applied Mechanics will benefit from this interaction, acquainting them with advanced methods which can highly assist in tackling complex mechanical problems. Following a long standing tradition of congresses in theoretical and applied mechanics, Serbian Society of Mechanics would like to invite you to participate in the 6th Congress in 2017. The Congress will be held on June 19-21, 2017, on mountain Tara, hotel "Omorika". The purpose of the Congress is to bring together the scientific communities of theoretical and applied mechanics in an effort to facilitate the exchange of ideas in topics of mutual interests, and to serve as a platform for establishing links between research groups with complementary activities. The Congress topics will include: General Mechanics, Fluid Mechanics, Mechanics of Solid Bodies, Biomechanics, Control and Robotics, Interdisciplinary and Multidisciplinary Problems. The deadline for the submission of scientific contributions (full papers and extended abstracts on two pages) is March 1, 2017. All submitted proposals will be reviewed by April 1, 2017. 25th International URBAN PLANNERS’ EXHIBITION will take place from 8th to 12th November 2016 in Sremska Mitrovica. Exhibition is organized by Serbian Town Planners Association under the auspice of Ministy of Construction, Transport and Infrastructure. The congress programme and exhibition are dedicated to HVAC&R profession and a series of professions that are inseparably connected in the design, construction, reconstruction, energy improvement, operation and maintenance of buildings with all technical systems, including lighting, electric power supply, water supply and sewerage, fire protection, energy efficiency management and all automation subsystems, management of building performance dynamics by a smart grid based on modeling predictive control, and entirely integrated management of energy supply and production of EnergyPlus buildings and delivering electric power to the electricity grid, including professionals in mechanical engineering, spatial and urban planning, architecture, civil engineering, electrical engineering and electronics, hydrogeology and hydrometeorology, environmental science, economics, security study, protection of natural and cultural resources as well as IC technologies. In the fifth decade of its regular organization, the international congress on heating, ventilation and air-conditioning will mark the jubilee – 45th anniversary of the journal of the Serbian Society for HVAC&R. United Association of Serbia for Quality (UASQ) in a cooperation Faculty of Technical Sciences Novi Sad with European Organization for Quality Brussels, Belgium, organizes the European Quality Week 2015 in Serbia, with the moto "Quality-Emotion-Inspiration". 12th Conference ''Q / E / O in the process industry"
8th Conference "Quality and IT"
The Conference will be held at Faculty of Technical Sciences, Novi Sad, from 19th-20th November 2015. 24th International URBAN PLANNERS’ EXHIBITION will take place from 6th to 13th November 2015 in Niš, in galery ’’Serbia’’. Exhibition is organized by Serbian Town Planners Association under the auspice of Ministy of Construction, Transport and Infrastructure. Opening ceremony of the exhibition is on November 6th 2015. The 28th international process engineering congress - Processing 2015, is organized by SMEITS (The Serbian Union of Mechanical and Electrical Engineers) and Technicians and its Society for Process Engineering. The first Processing was held in 1970 and it has had a tradition and continuity of gathering mechanical engineers as well as engineers from the fields of technology, chemical engineering, civil engineering, electrical engineering, mining engineering etc. The main objectives of the congress are innovations and expansion of knowledge in process engineering and provision of support to researchers in presenting the accomplishments of their research projects. The thematic fields of the Processing include the basic process operations - mechanical, hydro-mechanical, thermal, diffusion, chemical and biochemical operations, as well as process plants and equipment (apparatus and machines). Research and development of new equipment and industrial systems. This two-day congress will be held in Inđija, small town only 40 km from Belgrade and 35 km from the Belgrade Airport. UASQ – United Association of Serbia for Quality, EOQ (European Organization for Quality), Brussels, Belgium, organize the 8th International Working Conference Total Quality Management - Advanced and Intelligent Approaches. Fourht Special Conference "Manufacture in Serbia 2015"
2. The 6th Balkan Conference on Quality "The Balkan as a Region of Quality"
4. 29th Annual Conference of UASQ STC for Pharmacy - "Quality in Pharmacy- Future Challenges"
5. 13 Conference of UASQ Science Technical Committee for Quality Improvement in Agriculture and Veterinary Medicine -"ISO 22000 Standards and QI in Agriculture and Veterinary"
6. 11th Conference of UASQ STC for Quality Improvement in Health - care - "QM Model in health - care"
7. 10th Conference of UASQ STC for Quality Improvement in Military Industry - "QI in MI"
8. 11th Conference of UASQ STC for Quality Improvement in Public Services - "PS Improvements"
9. 11th Conference of UASQ STC for six sigma- "What is six sigma?" 10. 11th Conference of UASQ STC for Accredited Laboratories - "Applications and development"
The Conference will be held at Mechanical Engineering Faculty, str. Kraljice Marije 16, Belgrade, from 2nd – 5th June 2015. Fifth Serbian Congress on Theoretical and Applied Mechanics will be held on June 15-17th 2015. in Arandjelovac, hotel "Izvor". The Congress is organized under the auspicies of Serbian Society of Mechanics and is supported by Ministry of Education, Science and Technological Development of Republic of Serbia, Faculty of Mechanical Engineering, University of Belgrade and Faculty of Technical Sciences, University of Novi Sad. The increasing necessity to solve complex problems in Theoretical and Applied Mechanics requires the development of new ideas and innovative methods for providing solutions. The purpose of the Congress is to bring together the experts and young researchers in an effort to facilitate the exchange of ideas in topics of mutual interests and to serve as a platform for establishing links between research groups with complementary activities and to encourage them for collaboration in times to come. The community of Theoretical and Applied Mechanics will benefit from this interaction, acquainting them with advanced methods which can highly assist in tackling complex mechanical problems. This meeting has an international character and is open for all fields of theoretical and applied mechanics by bringing together scientists, engineers and young researchers it aims to promote exchange of ideas in topics of mutual interests, to establish links between scientific communities with complementary activities and to encourage them for collaboration in times to come. United Association of Serbia for Quality (UASQ) in a cooperation with European Organization for Quality Brussels, Belgium, organizes the European Quality Week 2014 in Serbia, with the moto "Winning through Quality". European Quality Week 2014 will be held in Novi Sad on 18-19th November 2014. United Association of Serbia for Quality (UASQ) in a cooperation with European Organization for Quality Brussels, Belgium, organizes the European Quality Week 2012 in Serbia, with the moto "Key Factor- Quality". European Quality Week 2012 will be held in Novi Sad on 14-15th November 2012. This year’s, the 43rd international congress is dedicated to the current topics from the broad HVAC&R field, primarily focusing on buildings as main energy consumers and the use of renewable sources and the most up-to-date products used in HVAC&R systems. The Organizer’s special wish is to promote the exchange of information on new building materials that affect the building energy demands as well as to present the most up-to-date building structures and their architectural designs in compliance with thermal performance, which are the preconditions for energy efficient behaviour of buildings. The topics include refrigerants which substitute conventional ones that are being phased out due to their environmental impact. The district heating and cooling systems remain the inevitable topic of this gathering of HVAC&R professionals. Congress in the organizatin of The Serbian Society for Heating, Refrigerating and Air-Conditioning within the Union of Mechanical and Electrical Engineers and Technicians of Serbia (SMEITS) will be held in Belgrade from 5th-7th ecember 2012. "QUALITY FOR EUROPEAN AND WORLD INTEGRATIONS"
7th Conference of UASQ STC for Quality Improvement of Public Servicies – PS improvements. 7th International Conference of UASQ STC for six sigma – What is six sigma? The Convention will be held at Mechanical Engineering Faculty, str. Kraljice Marije 16, Belgrade, from 7th – 11th June 2011. The Serbian Union of Surveyors in cooperation with scientific and professional institutions organizes the XXIV Meeting of Serbian Surveyors and International Scientific Conference titled PROFESSIONAL PRACTICE AND EDUCATION IN GEODESY AND RELATED FIELDS. After successful international scientific and professional conferences and exhibitions of surveying equipment, held in cooperation with the INTERGEO EAST 2004, 2006 and 2008 in Serbia, we expect further continuity in the work and sharing of scientific and professional knowledge as well as practical experience. The official languages of the Conference will be English and Serbian. Simultaneous translation will be provided only in plenary session. The Conference will be held in Kladovo Hotel "Đerdap", from 24-26th June 2011. Prospective authors are invited to send their contributions on relevant topics. Papers may be submitted by e-mail in a Word file. The length of the paper should be 6A4 pages; 1.0 space typing; use Arial 10 point font. Please identify the following information separately: the title; author's full name; address; e-mail address; telephone and fax numbers. April 01; 2011 Deadline for the submission of abstracts. May 20; 2011 Full paper ; 6 pages; electronic submission. May 24; 2011 Registration announcement. June 01; 2011 Final paper acceptance. June 10; 2011 Final program. 24th – 26th June Conference. 7. 6th Conference of YUSQ STC for Quality Improvement of Public Servicies – PSimprovements. 8. 6th International Conference of YUSQ STC for six sigma – What is six sigma? The Urban Planners Exibition is a traditional annual manifestation of Serbian Town Planners Association, which is the review of the most important actual work in the field of spatial and urban planning, designing and realizations. This year`s exibiton will be held from 6th till 13th November. After premier exposition in Niš, the Exibition will be presented in other cities in Serbia and abroad. The Serbian Society for HVAC&R (KGH) of the Serbian Union of Mechanical and Electrical Engineers and Technicians (SMEITS) is the organizer of the 40th International HVAC&R Congress and Exhibition of Equipment and Accomplishments, as well as all other congress accompanying events. The Congres will be held on December 2-4th 2009 in Belgrade. This year’s international congress and exhibition on heating, refrigerating and air-conditioning will be in the sign of its multiple jubilee celebration − the 40th anniversary and 40 congresses held since the first one in 1970, and the 40th anniversary of the Serbian Society for Heating, Refrigerating and Air-Conditioning, which was founded at the first congress in 1970. From its start in the form of a symposium, this convention dedicated to HVAC&R has turned into an international professional and scientific event held in Belgrade every year, and has acquired international recognition and reputation of one of the most important congresses in the field of energy, energy demands for HVAC&R and rational energy consumption. This year’s congress will specifically deal with energy efficiency in the field of the biggest global consumer – the building sector. A special attention will be paid to energy upgrade of the existing buildings and a necessity to introduce new regulations and evaluation of energy efficiency of buildings and their HVAC&R systems, in accordance with conservation of fossil resources and use of renewable energy sources. A special attention will be paid to the improvement of the indoor environment quality for better indoor living quality and more productive work, the environment protection by reducing emission of harmful gases and greenhouse effects and reduction of the risks of the global climate change by creating conditions for the sustainable development approach. And, since the congress has considered energy effects of all the professional fields on HVAC&R for many years, we are also expecting participants who will deal with the issues regarding architecture, civil and structure engineering, environment and economy. The Serbian Geological Society, the Faculty of Mining and Geology and the Association of Geological Engineers and Technicians have a long tradition in organizing geological meetings. The 15th Congress continues this practice with a demonstration of the latest research results and achievements in geological sciences. The Congress activities will demonstrate the importance of geology in solving problems of a geological nature, natural resources research, analysis of natural hazards, environmental protection and issues of urban planning and construction of infrastructure facilities. The Congress events will include plenary sessions, oral and poster sessions, panel discussions, special sessions and field trips . The Official Congress languages are Serbian and English. The Congress will be held in Belgrade, on May 26 - 29, 2010. Fourth Belgrade International Architecture Week - BINA '09 is to be held 26th June - 4th July 2009. Belgrade International Architecture Week 09 again gathers various professionals involved in REthinking of the urban and architectural context, various generations ready to share the old with the new ideas, and the representatives from different countries across Europe and the USA. Belgrade International Architecture Week 2009 (BINA '09) - titled simply RE... as an indicator of this year's theme - is dedicated to the acute question of our relationship to the existing urban and architectural surroundings and the limitless possibilities of its permanent REproduction, actively involved in projects for the future. Our wish is to REquestion the traditional concepts of REconstruction and REvitalization of cultural heritage - mainly controlled by stiff methodologies promoted by lethargic institutions - in search for new concepts that can help REgeneration and REintegration of the existing fabrics into the lively contemporary practice. 3dr Landscape Architecture Exhibition will take place in Belgrade , from 2nd till 14th September 2009. The organiser is the Serbian Association of Landscape Architects .The place of the event is The IKAR Gallery , Club of Aviation, Zemun, Belgrade, Serbia. The content of the exhibition are plans of all categories, designs, studies and research on the landscape architecture, publications, student projects of all kinds. In the organization of YUSQ - United Association of Serbia for Quality and EOQ - European Organization for Quality, International Convention on Quality YUSQ -2009 will be held in Belgrade, on June 1st-4th 2009. 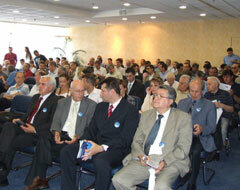 The moto of this year`s Convention is "QUALITY FOR EUROPEAN AND WORLD INTEGRATIONS". The main objective of the ICQ 2009 is to provide an internation forum for the exchange of knowledge, experience, research results and information about various aspects of the state-of-the-art and the future development of quality management /IMS and TQM/BE. The scope of the ICQ 2009 covers philosophical, scientific and practical concepts concerning research, development and application of QM-based approaches and IMS. The 30th Congress on Heating, Refrigerating and Air conditioning will take place in Belgrade`s congress centre "Sava" in the period 3-5 December 2008. This event will be devoted to the centennial celebration of the International Institute of Refrigeration whereof the Kingdom of Serbia was one of the founders in the years of 1908 and 1909. The Congress will be the final celebration of the series of meetings, which will be organized during this year celebrating the existence and useful and important acitivity of this inter- governmental institution. Union of Mechanical and Electrical Engineers and Technicians of Serbia in a cooperation with Serbian Society for Nondestructive Testing and Serbian Society for Advancement of Welding is organizing a unique event. From June 4th till 6th in Subotica, at the same time, will be held 21 Congress with international participation on process industry "PROCESING `08", 25. Conference with international participation "Welding `08", and 25. Conference with international participation "NDT 2008". The 38th HVACR congress is dedicated to current problems od today`s energy engineering and management: rational and efficinet use of energy, its impact on the environment and health of people who live and work in indoor environment, reduction of energy consumption in buildings, renewable resources as well as building design and construction with full cooperation of architects and engineers - energy, civil, electrical and mechanical engineers. Hence the motto of the Congress is "Energy - a precondition of Survival", but also "Energy - a Threat to the Environment". These two opposite conesequences represent a big issue to be solved by experts in various fields, but in its most vital element, this issue is perhaps to be solved by engineers who attend this Congress. Official languages of the Congress are Serbian and English. Congress is to be held from October 5th-7th 2007, in Belgrade "Sava center". In the organization of YUSQ-United Association of Serbia for Quality, with help and support of several dozens of organizations from the country and abroad, International Convention on Quality YUSQ 2008, with the moto Ouality for European and World Integrations, will take place in Belgrade, from 26 to 29 May 2008. 7th International YUSQ Congress "Bussines Excellence"
The 20th Council of Serbian Surveyors was held on Zlatibor, from May 18 to 20, 2007. This year`s council of the surveyors was the opportunity for bringing together the experts, practitioners, managers and exchange of the opinions concerning the implementation of legal solutions which will provide more efficient realization of the programs and projects connected with the modernization of cadastre system in Republic of Serbia. The Congress 2007 is organized by Serbian Society of Mechanics, under the auspice of Ministry of Science and Environmental Protection of Republic of Serbia. The Congress will take place on the most beautiful mountain in Serbia, Kopaonik, from April 10-13th, 2007. The purpose of this Congress is to bring together the scientific communities of Theoretical and Applied Mechanics in an effort to facilitate the exchange of ideas in topics of mutual interest and to serve as platform for establishing links between research groups with complementary activities. This year`s 37th Congress organized by Society of Heating, Refrigeration and Air-conditioning of The Union of Mechanical and Electrical Engineers and Technicians of Serbia took place in Sava Center, Belgrade, from December 6-8th, 2006. The Congress thematic fields reflected the problems that energy engineers, producers and experts deal with. The topics included intelligent systems for building, natural and artificial lighting energy, comfort conditions and various new devices and products. With more than 800 participants and successfully organized exhibition this Congress was more successful than the previous once. 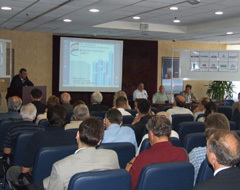 20th Congress with international participation on process industry PROCESING 2007 took place in Belgrade from June 13-15th, 2007. The Congress is organized by the Union of Mechanical and Electrical Engineers and Technicians of Serbia under auspice of Serbian Chamber of Commerce and Serbian Chamber of Engineers. 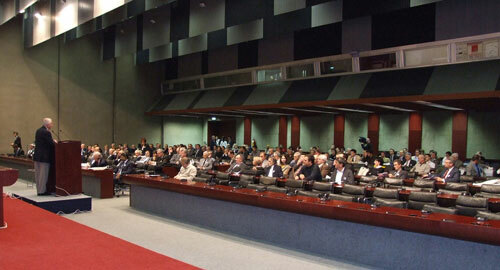 More than 150 engineers from country and region participated at Congress. This year`s Congress thematic fields covered all areas of process engineering, and one of the main topics of Congress was consideration of the situation and future perspectives in process industry.